You got something in the mail today, the man’s wife says. It looks like it’s from your uncle. The man takes the package and holds it in his hands. He opens it. This sword was used by your great-great-great-grandfather during the civil war, the man reads. I thought that you might like to have it. Very nice of my uncle, the man says. She goes back into the kitchen. A sword, she says. Just what we need. The man holds the sword up. He looks around the room. Honey? he says. Can we hang it on the wall? What? says his wife. Are you kidding? If that thing falls, it could chop off your head! The man thinks a moment. What about in the basement? he says. Oh, says his wife. That’d be fine. The man goes downstairs and turns on the light. He finds a good spot and gets a hammer and some nails. Honey! he calls– when he’s got the sword up– you really should come down and see this! I’m sure it looks nice, the man’s wife calls down. The man reaches out and straightens it. The rest of the evening is pretty uneventful, but in bed that night, the man has a dream. In his dream, the man sees his great-great-great-grandfather– on a white horse, in the midst of a raging battle. He’s holding the sword way high up over his head, and using it to point the way forward. So in the morning, when the man’s done eating his breakfast cereal, he opens the door and goes down into the basement. He stands there, staring at the sword on the wall. Slowly, he reaches out and lifts it off. He weighs the blade thoughtfully and holds it out before him. He smiles– it feels good in his hand. He lunges and parries as best as he is able. Maybe I should take lessons, he says. So the next day, the man goes to his first sword-fighting lesson. 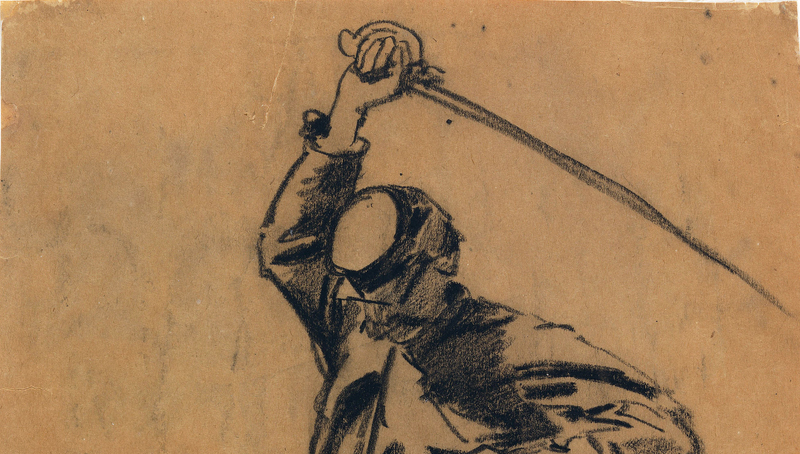 Not fencing, but sword-fighting— the real thing. The lessons are held in the instructor’s basement. The instructor is very, very strict. None of you people have any talent at all! the instructor screams at the pupils. Then he stops and watches the man for a while. Well, you, he says. You might be somewhat capable. The man practices hard. He quickly gets good. He gets so good, he’s entered into a tournament. On the day of the event, the man comes in first place. He is undefeated in combat. In the audience, two people sit watching in amazement. He’s only been practicing a few months, the first says. It’s almost incredible how he blossomed so quickly. Well maybe he didn’t, the other says. What? says the first. What do you mean? There could be another explanation, the second says. What I mean to say is, it is just possible that he’s the reincarnation of a great, great swordsman. Reincarnation? says the first. You believe in that stuff? They both turn and look up at the man. And up there onstage, where he stands holding his trophy, the man overhears their whole exchange. Is it possible that I am my great-great-great-grandfather? the man thinks, lying in bed that night. Is it possible that I’m him, reincarnated in this body? Reincarnated in me— in my mind? And that night, when he sleeps, the man again dreams he sees his great-great-great-grandfather before him– still on the battlefield, now screaming a battle-cry. Now hacking about, stabbing and slashing. The next day, the man makes a phone call to his uncle. Tell me about my great-great-great-grandfather, he says. Well, says his uncle, what do you want to know? Absolutely everything, the man says. Well, says his uncle, apparently he was quite dashing! But by all accounts, just a terrible man. He was a drunkard and a layabout. A failure in business. He abandoned four wives and ten children. Well, says the man, what happened to him? I mean, you know, in the end? In the end? says his uncle. He died in the gutter. But he was a great swordsman– that has to count for something! The man hangs up in the grip of mortal terror. He resolves right then and there to give up sword-fighting. He resolves to improve himself, to become a better man, to do everything he can for his wife and children. And so that’s what he does. He gets a better job. He starts going to church; he becomes a little league coach. And his work is rewarded: he is promoted three times, buys a new car, an RV, a bigger house. He takes his family on vacation to Disneyland, and the next year they go to Acapulco. He gets his picture in the paper shaking hands with the mayor. He teaches his whole family to play golf. Isn’t life grand? the man says to his wife, lying in bed at night. It certainly is, the man’s wife says. And everything seems very, very nice. But still, at night, the man has these dreams– these dreams that won’t go away. These dreams of his great-great-great-grandfather on the battlefield, hacking people apart. And as time passes, the dreams intensify– they don’t fade away as the man would’ve hoped. It gets to the point where he’s afraid to go to sleep; every night, the bloodshed gets worse. And– worse than that— the dreams have migrated from the battlefield– they’re here, now, in the modern age. They’re in the man’s town– in his neighborhood– on his lawn. And now he himself is holding the blade. At that point, the man decides to stop sleeping; he just stays up, alone at the kitchen table. Sitting there, holding his head in his hands. Praying that somehow it will end. And finally, one night, a knock comes at the door. In a daze, the man opens up. There on the porch is a stranger with a sword. I’m here to challenge you to a duel, the stranger says. I’m sorry, says the man. I don’t swordfight anymore. En garde! cries the stranger, and he lunges. The man stumbles backward into the house. He dives over the couch and flees down the hall. He digs his sword out from the back of the closet, turns to face the stranger, who’s slashing wildly about. The two fight their way through the rooms of the house, then spill out onto the deck, across the yard. They fight across the grass, around the garden and the swimming pool, swords clashing, flashing in the dark. The man is a talented swordfighter– very talented– but he’s out of practice, and the stranger is better. It doesn’t take long before the tip of the stranger’s sword is whittling away the man’s skin. I give! yells the man. I give! I yield! But the stranger just shakes his head. You can’t yield, he says. This fight is to the death! Please, have mercy! the man says. Mercy? says the stranger. I don’t know what that means. He knocks the man’s sword to the ground. He raises his own above his head for the killing blow. But just then a shot rings out. The stranger freezes, then crumples to the ground. Blood pours forth from a bullet hole in his head. The man looks over. His wife is on the back porch. She’s holding a smoking gun in her hand. Honey, says the man. I didn’t know you had a gun. His wife steps down from the porch. She moves across the lawn, tucking the gun into her robe. Don’t be silly, she says. Of course. Of course? says the man. He frowns, then hears a noise. He turns and looks toward the fence. And there, on the other side, he sees his next-door neighbor, holding a crossbow in his hand. Don’t worry, says the neighbor. We wouldn’t have let him get you. The other neighbors are standing to the side. One has a flamethrower, and the other a pair of nun-chucks. Another has brass knuckles on either hand. The man stands there, staring. His wife touches his arm. It’s all right, she says. It’s all okay. She smiles and gives the stranger’s body a kick. Let’s get this in the ground, though, she says, before it starts to stink. For a moment, the man looks at her. Then he nods his head. They bury the body and go back into their home. They put away their weapons, and they turn out the lights. And when they go to bed, the dreams don’t come. Ben Loory is the author of the collection Stories for Nighttime and Some for the Day, and a picture book for children, The Baseball Player and the Walrus. His fables and tales have appeared in The New Yorker, Tin House, Gargoyle Magazine, and The Antioch Review, and been heard on This American Life and Selected Shorts. His second collection, Tales of Falling and Flying, is coming from Penguin in September. Homer, Winslow. “Cavalry Soldier with Sword on Horseback,” 1863. Cooper Hewitt, Smithsonian Design Museum. [Public Domain], via Wikimedia Commons.org.